Review: Now here's a soundtrack that represents the classic horror films of the 80s like no other. What's truly impressive is that for a film score that sounds so perfect for horror, the Creepshow soundtrack was entirely composed by John Harrison on nothing but two grand pianos and a Prophet V synthesizer. I often have people asking me what's the best music to have playing in a haunted house during Halloween season, and sure, you could go with one of the thousands of generic "spooky" sound effects CDs out there, but you'd be selling yourself short. If you wanted to create a truly effective eerie atmosphere, then I'd strongly recommend trying the Creepshow soundtrack. If there's anything John Carpenter taught us with his music, it's that minimalism truly works wonders in the world of horror. You don't need oodles of instruments playing together... sometimes keeping it simple with just a piano and a synthesizer is far more capable of getting under the listener's skin, and Creepshow accomplishes exactly that. 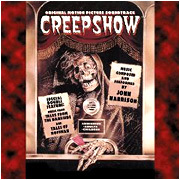 A little bonus is that the Creepshow soundtrack CD also includes music from the Tales From The Darkside television series along with music from "Mansions of the Moon" and "Shoobie Doobie Moon" (two George Romero projects that were never filmed). Can't say I'm a fan of the "Moon" songs, as they really don't fit in with the rest of the soundtrack, but it's just bonus material so I can look past that. Now don't be a lunkhead like Jordy Verrill... find yourself a copy of this album and make your Halloween all the more creepy. I wonder where you could find this album. Thriftstore? I didn't even know they reproduced Movie Sound tracks. It's still in print actually, so you can find it on Amazon or wherever really. Actually ROG, it was a Prophet 5 synthesizer. Yes, V and 5 are usually interchangable, but not in this case, because the Prophet 5 was the actual analog hardware synthesizer, and the Prophet V is a software emulation made by a company named Arturia. It's a good emulation, but it simply wasn't out at the time Creepshow was made. You just can't go wrong with Creepshow.